Render of a Darknut from Twilight Princess. A Darknut (タートナック, Tartnuc) is an enemy type from The Legend of Zelda series. Link fighting a Darknut in The Legend of Zelda: Twilight Princess HD. Darknuts debuted in the first The Legend of Zelda, and returned in several later games. They are enemies of above average strength, even appearing as minibosses, and they sometimes employ advanced fighting techniques. In some games their armor can be removed, and after losing it their fighting style changes. 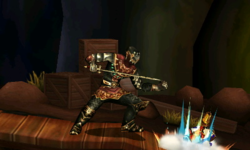 With the exception of the Brawl Sticker, Darknuts in Super Smash Bros. are based, appearance and behavior-wise, on their Twilight Princess version. A Darknut appears in Brawl as a trophy using its design from The Legend of Zelda: Twilight Princess, and as a sticker using its design from The Legend of Zelda: The Wind Waker. Despite appearing as an enemy in almost every Zelda game, the trophy only references Twilight Princess. 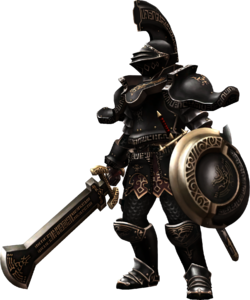 A knight enemy clad in heavy armor that defends with a shield and attacks with sword techniques and kicks. Darknuts lose their armor as they take hits, but they grow faster in the process. Their sword skills are quite accomplished. The most fundamental way of dealing with Darknuts is having good command of spin attacks and back slices. A Darknut (right) in Smash Run. Darknuts appear as powerful enemies in Smash Run in Super Smash Bros. for Nintendo 3DS in their Twilight Princess design. Darknuts will attack by swinging their large sword, which does heavy damage and knockback, and their shields are a reflector. Once they have sustained enough damage, they drop their armor, becoming quicker but more vulnerable to attacks. While their armor is intact, they are slow, but they are highly resistant to flinching. Once their armor is removed, they become much faster, though their flinch resistance is reduced somewhat: weak attacks barely cause them to flinch, but stronger attacks can interrupt their movements. Furthermore, when the armor is removed, they will always respond by throwing their sword before switching to a slightly smaller sword. Defeating them yields large stat bonuses. These heavily-armored, bulky enemies often seen in the Legend of Zelda series are slow but powerful and can use their swords to block attacks and projectiles. When you're faced with one, you'll need to slowly cut away its armor. Once it's gone, the Darknut will become more agile, but it'll also be more vulnerable! These heavily armoured, bulky enemies often seen in the Legend of Zelda series are slow but powerful and can use their swords to block attacks and projectiles. When you're faced with one, you'll need to slowly cut away its armour. Once it's gone, the Darknut will become more agile, but it'll also be exposed enough to be beaten.